Mississippi was the only state in the nation to have a significant increase in grade 4 math scores. Mississippi was one of 13 states with a significant increase in grade 4 reading scores. Mississippi was the only state in the nation to have significant gains in both grade 4 math and reading. Mississippi’s grade 4 math proficiency rose from 26 to 30 percent. Mississippi’s grade 4 reading proficiency rose from 21 to 26 percent. 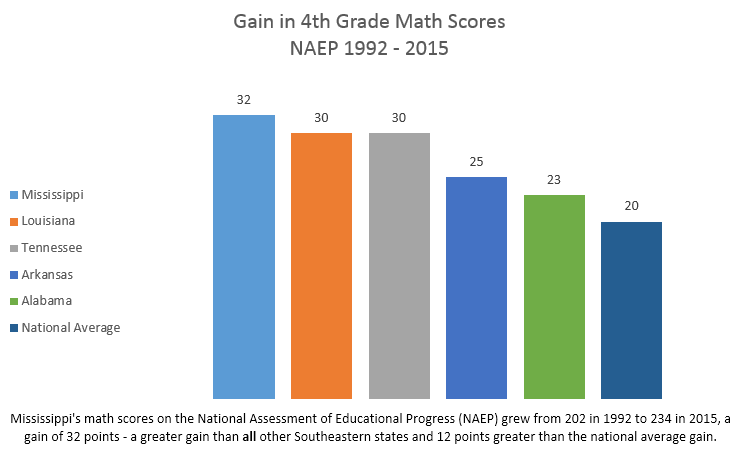 Mississippi’s long-term (1992-2015) gain in grade 4 math was greater than all neighboring states and all Southeastern states (including North Carolina, South Carolina, Georgia, and Florida), and 12 points greater than the national average gain. 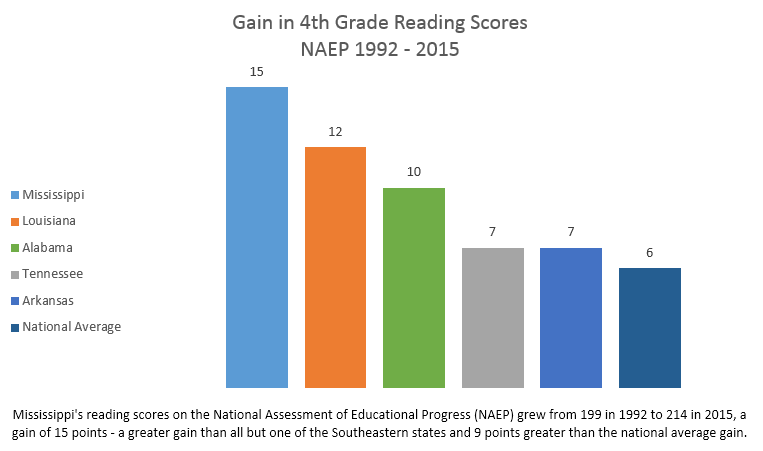 Mississippi’s long-term (1992-2015) gain in grade 4 reading was greater than all neighboring states and all but one of the Southeastern states (including North Carolina, South Carolina, and Georgia; Florida’s gain was 4 points above Mississippi’s), and 9 points greater than the national average gain. Every other year, the National Assessment of Educational Progress (NAEP – also called The Nation’s Report Card) is administered to randomly selected groups of students in grades four and eight in each state, the District of Columbia, and Department of Defense schools to assess proficiency in math and reading. States’ average scale scores are reported overall and by sub-group, including by students living in poverty (economically disadvantaged) and students not living in poverty. Mississippi’s overall scale score rankings are 47th for 4th-grade math, 48th for 4th-grade reading, 49th for 8th-grade math, 51st for 8th-grade reading.